The original conditioning after shave formula that helps clear and prevent unsightly razor bumps caused by ingrown hairs. 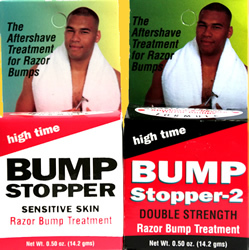 A double-strength formula of the original skin conditioning after shave treatment for really stubborn and severe razor bumps. Twice the active ingredients. Specially formulated for individuals with more serious conditions. Very good product , so far so good for me.